If you forget to get your eggs out of the refrigerator (as I nearly always do) you can take the chill off by putting them in warm water....5 to 10 minutes. I just noticed the title is a little wopsided. Did you notice it, also? ***Note to self....correct. I repeat....correct. Some of those extra blueberries, I mistakenly added 4 cups instead of 2, made a delicious layer on the bottom when I cut it still hot from the oven. I love mistakes like this! 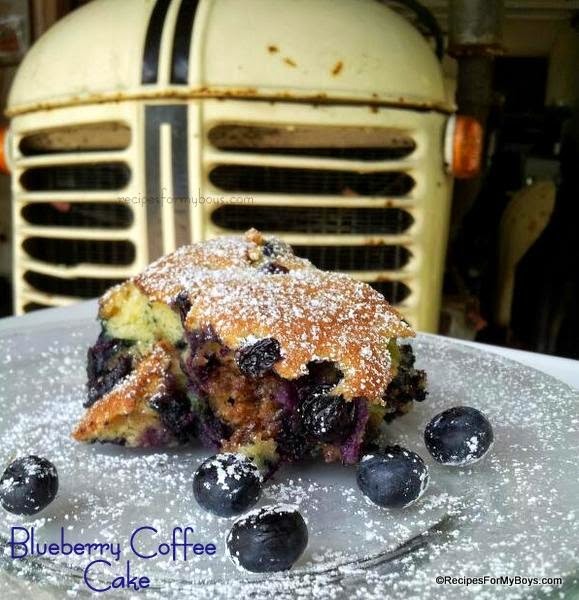 I took hubby his Blueberry Coffee Cake while he worked on his old Case tractor. He is getting it ready to put up for sale. Such a fun old work horse! I think it was made in the 50's. This is sooooo good! I added lemon extract to the batter. Just because. Ever so carefully, toss the blueberries in with a little bit of flour. 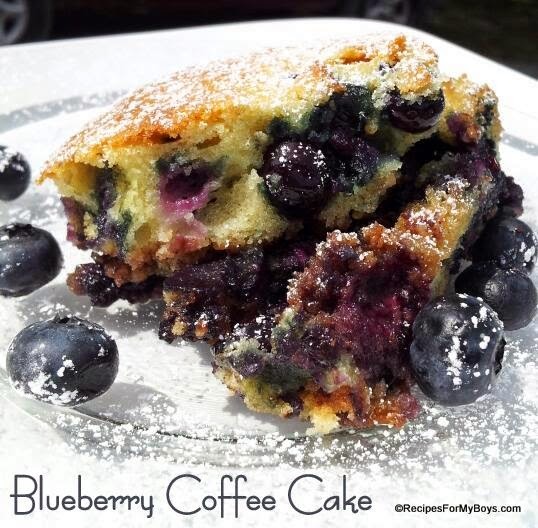 Go ahead and Gently fold in all those lovely blueberries in the light cake batter. YUMMO! I'm seriously going to bake this in a bundt pan for a gorgeous blueberry pound cake! I started to make it like that this morning but hubby was hungry and I had to feed him and my boys, ya know. You just have to find the fastest way to get something in their hungry little mouths to keep happiness in the house. This layer adds just the right sweet, cinnamon pecan layer to the light cake and bounties of blueberries under and over. I didn't add sugar and butter so perhaps, this isn't really a streusel layer but an added depth of flavor layer. Add the top layer of berries and batter. Isn't that just lovely? Some how or another, I ended up doubling the amount of blueberries in this recipe. And, oh my, I was so afraid it wouldn't fit in the pan I had prepared! This is a 10 x 8 pan...it was a tight fit as you can see. I'll use a 13 x 9 pan next time, if I don't make it in a bundt pan. I gave the top a light sprinkling of powdered sugar. Why? I do not know, but it tastes wonderful and looks pretty, don't you think? It is equally delicious without. I kept this in the refrigerator overnight and the coffee cake tastes like a handheld cobbler. 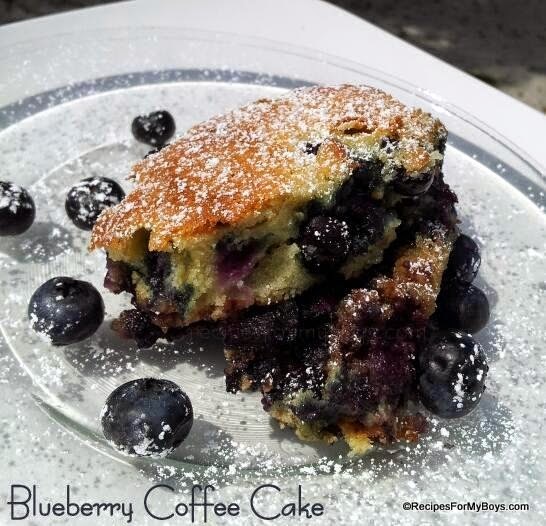 Extremely moist and bursting with blueberry and that sweet, cinnamon pecan flavors. I suppose if I have followed the directions, there would be more cake and less berries. So glad I didn't! 2 to 4 cups fresh (or frozen) blueberries, fresh is rinsed and patted dry. If frozen, use out of the freezer. Preheat oven to 350 degrees F. Spray 10x8 or 13x9 baking pan with non-stick cooking spray. Beat sugar and room temperature butter together until light, scraping sides. Add eggs, one at a time, beating after each addition. Add baking soda and sea salt to flour save 1 Tablespoon to toss with blueberries. Alternate beating in flour and sour cream, ending with flour. Beat in vanilla or lemon extract. 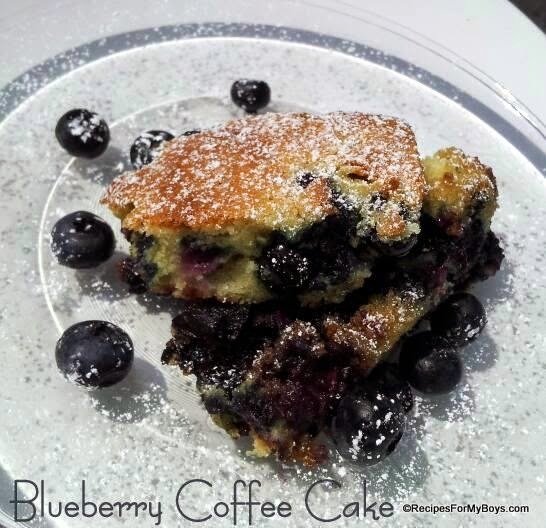 Gently toss blueberries with flour. Fold into batter. Spread half of batter in prepared pan. Mix cinnamon with brown sugar and pecans, sprinkle over batter. Spread remaining batter over streusel. Bake in preheated oven 35 to 45 minutes or until toothpick, inserted in center, comes out clean. Let cook in pan. Sprinkle with powdered sugar, if desired. Serve warm. I keep this in the refrigerator since there are so many berries in it and the bottom is a little moist.